Soon we’ll be saying goodbye to the endearing young cast of The Moon That Embraces the Sun, who did such a solid job of anchoring the show in emotion, conflict, and cuteness. Their appeal surely sets up the adults (Kim Soo-hyun, Jung Il-woo, Han Ga-in, Kim Min-seo, Yoon Seung-ah) for lots of goodwill as they make their entrances, so let’s take one last look at a couple of the youngsters at the heart of the show: Lee Min-ho playing Yang-myung, and Yeo Jin-gu as young Prince Hwon. Next month, Lee Min-ho will graduate from high school, and he plans to enroll at Joongang University, where he’ll study theater and film. Lately he’s been on the receiving end of so much interest that he’s beat out that other Lee Min-ho in search result rankings, although he figures that those results are just a factor of who’s being talked about right now and may swap back soon. 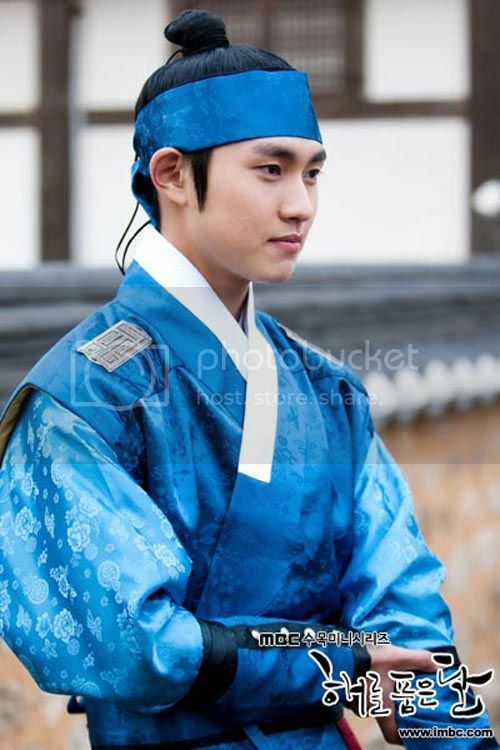 His Yang-myung character harbors feelings for Yeon-woo, who has been (as of our most recent episode) designated the future wife of Prince Hwon. 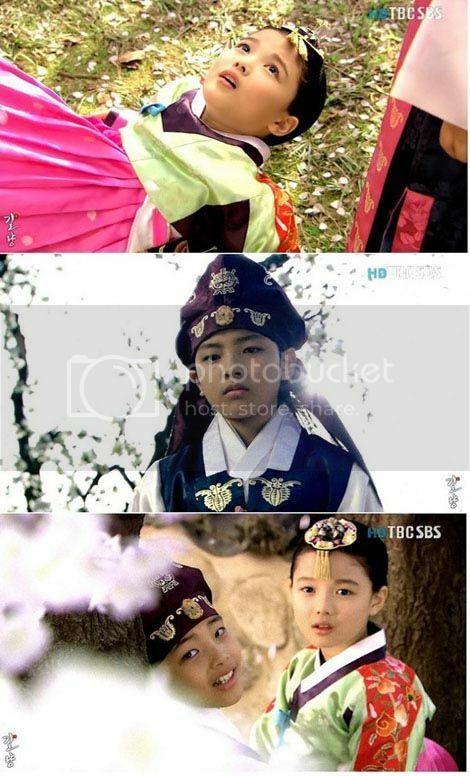 Yeon-woo’s played by 12-year-old Kim Yoo-jung, with whom Lee Min-ho has acted in a previous drama (Gumiho: Tale of the Fox’s Child). Then there’s his young co-star, Yeo Jin-gu, already a familiar face despite his young years. Born in 1997, he’s in his second year of middle school and has also been acting from a young(er) age; his debut came at age eight in the 2005 film Sad Movie. Credits: He played young Lee Jun-ki in Iljimae (where he had a young love with Kim Yoo-jung, adorably), young Jo In-sung in Frozen Flower, young Lee Beom-soo in Giant, young Ji Chang-wook in Warrior Baek Dong-soo, and young Ji Sung in Swallow the Sun. He’s played young Jang Hyuk twice — in Tazza and again in Tree With Deep Roots (briefly, as adolescent Ddol-bok). Moon/Sun marks a pretty big growth spurt for Yeo, and that apparently lost him one role. Jang Hyuk took to him when he played his younger counterpart in Tazza (he was adorable as the feisty young swindler), and thought of him for Tree: “Hyuk hyung says he wanted me to play the child role, but that I’d grown too much so I wouldn’t be right.” But Jang Hyuk had grown attached to the idea, and recommended Yeo Jin-gu for the brief sequence as child Ddol-bok grows into a teenager. I think I speak for more than just myself when I say: Can’t wait to see these kids grow up. I'm going to miss them so much...They were amazing actors! i'll be missing u all!! Both of them are so sweet. Wow time flies, they were cute little things a few years back and now they could take on more adult roles ^^ Hope they have great acting projects in the future!! Thanks for igniting my Moon/Sun addiction!! The young cast of Moon/Sun has really left a memorable impression on me and I have to say that I am quite sad that we won't be seeing them again. I really cannot wait for these child actors to grow up as with those acting skills already, they will be sure to become better and more amazing in future roles. Gaaah, they are just so adorable- how can you *not* love them, really? ^^"It seemed like Yoo-jung and Jin-gu were getting a lot closer, so I started to feel jealous. 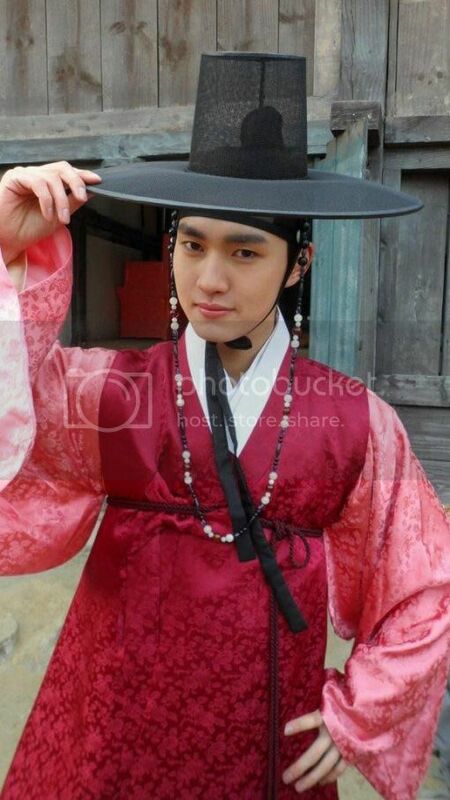 In the drama, it was really easy to get into character for the scenes where I feel jealousy. Haha." ^^---> if this doesn't scream that he likes her i don't know what does. :D But, obvs she's just soo young. And, not to forget stunning. As for Jin-Gu it's awesome that he's had this heart to heart talk with Jo In-Sung and Jang Hyuk was gunning for him to play his younger counterpart. Awesome. Haven't started watching this show but still taken to it. can someone post me the link for this show. The child actors in this drama is so amazing especially Yeo Jin-gu. I've loved him in every drama that he's been in. I surely cannot wait to see all of them grow up. I feel the same way,especially about LMH,and I got interested in this drama because of JIW at first! 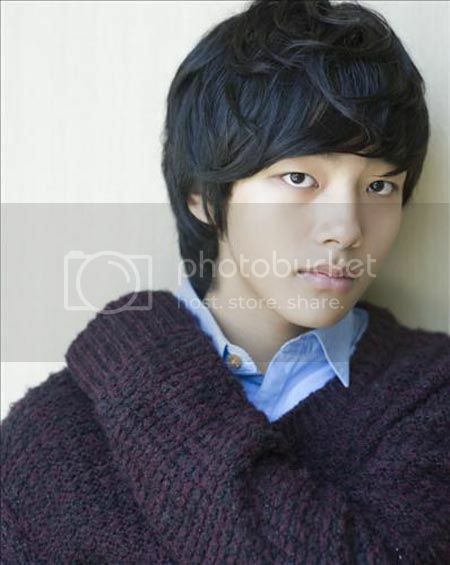 According to the dramawiki and other sites the young Jang Hyuk in "Tree..." played Chae Sang Woo, not Yeo Jin Goo. If you'll read the article again, you'll note that he played the adolescent character, not the child version. thank you javajavadooo,,as usual ..simply amazing!!!!!! "I think I speak for more than just myself when I say: Can’t wait to see these kids grow up." OMG, I was just thinking the same! They are going to be so handsome and the next stars in the making!! I can't wait to see their potential and me squeeling like a teenager even at 35! LOL! gah! i love this show! 1997? Really? Oi. I watched my first dramas before that. I know I'm old but what a reminder! Reading their date of birth is like a shock to the system. So young and so talented, all of them and yeah, makes one feel their age, every single year. They will be an interesting bunch to watch in the future. 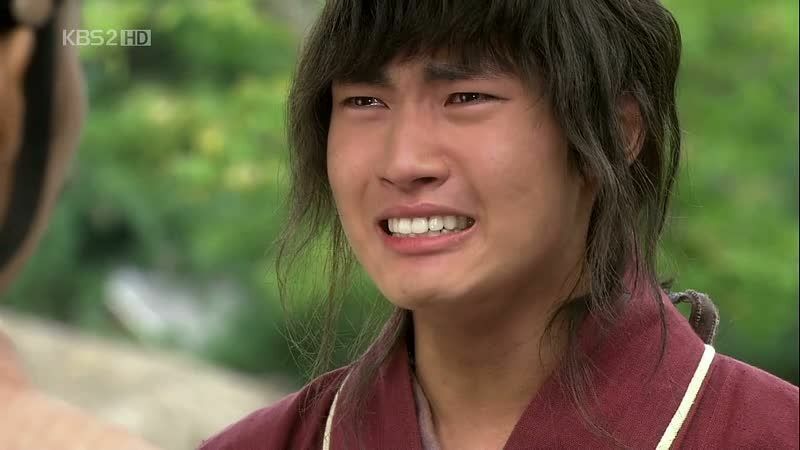 Lee Min Ho's role in SKKS was memorable. i don't even have to re-watch them again to recall him. "he’s beat out that other Lee Min-ho in search result rankings"
Do they only account for Lee Min-ho with some kind of qualifier that identifies the search is for 93LMH? Cause I remember searching for "Lee Min-Ho" and getting the wrong one. How do they know what the searcher means to find? I love the child actors, so I'm all over this article. Thanks, JB. I know I've already said it before on a recap but I LOVE these child actors. They've done such a good job with the drama so far! Definitely a VICOMYB. Sigh, I would hate to see them go off tomorrow. NB : VICOMYB = Very Inappropriate Crush On Much Younger Boys. LOL! What a nice acroymn! Aaaw, too bad we didn't get a interview from Kim Yoojung, but this is awesome. I really will miss them after this. But I hope to see them again. P.S. Lee Minho, don't grow up too fast ok? Stay adorable a little bit younger. P.P.S. Enjoy your childhood guys. It only comes around once. aarrgghh... i'm going to miss YJG sooo bad when KSH came out... korea really need to make a teenage drama, maybe god of study season 2?? They really have a cute and talented younger cast. Yeo Jin Gu is only 15? Kim Yoo jung is 12? I'm impressed by their acting. They're better than some of the singing idols who are trying to act in dramas. I love some my idols, but yeah you're absolutely right. But then, these kids are born to be actors.. I just love love the younger casts, and once again I'd like to wish, somebody please make a teen drama for them! Something like "God of Study", maybe? Eek, is Yeo Jin Gu the little kid that made me weep like a baby in Sad Movie?! 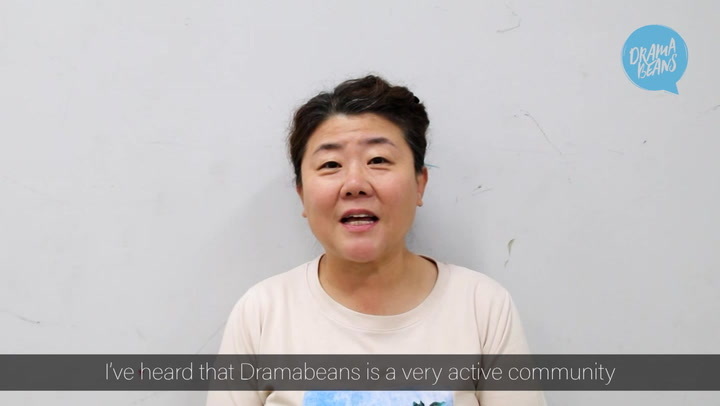 The one who hired Cha Tae Hyun's character so he could tell his mommy he didn't love her anymore because she was leaving him, i.e. dying? Whoa. He's the reason my toughest macho friend still refuses to talk about that movie. Every time someone mentions it, he clears his throat and changes the subject. Pffft. omg.. yeo jin gooo!!! I have falled HARD to him since iljimae. what a performance! and his acting in giant n baek dong soo n now moon sun is getting better n better. I initially watch moonsun solely for him, and never regret it, he grown so much ^^ i couldnt believe he still 14, he looks tall for his age. its funny how jang hyuk gunned on him to play his child counterpart.. since I always got a jang hyuk-vibe from jin goo, especially in his Giant days. his eyes! 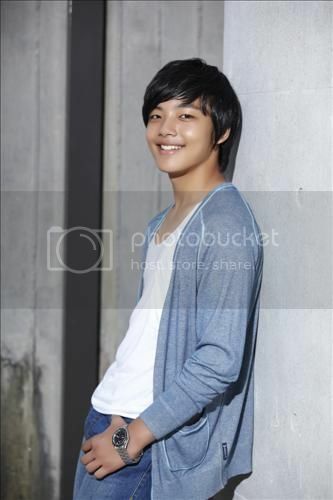 aah.. please grow fast jin goo-ah!! 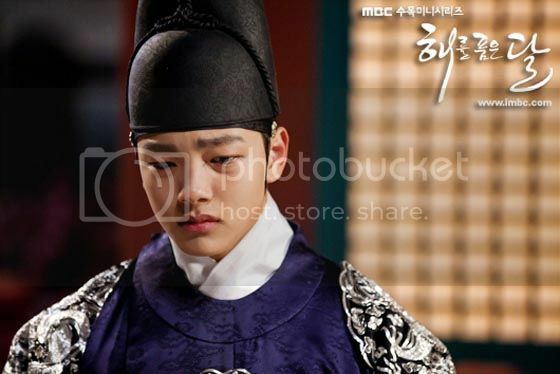 Really sad that the child cast are exiting MoonEmbracesSun! Will miss them and hope to see them in other dramas soon! Yeo Jin gu is growing up fast! he was so small in iljimae! I really liked Lee Min Ho in SKKS and am glad he's getting more recognition here for this drama! These young actors are so freaking amazing that it breaks my heart to say goodbye. Lee Min Ho did make my heart flutter x) I really hope to see him in more projects. There was not one flaw in the acting considering Siwan is an idol. He totally was perfect and played the part superbly. Sigh~ it's really goodbye Thursday for them and Hello Thursday for the older actors. GEEZ.....Our time flies by!!! Aiyhoo...aiyhooo. MUST. RESIST. TO. NOT. WATCH. MOON EMBRACES THE SUN. MUST. RESIST!!! That's exactly what I've been telling myself! ^5. 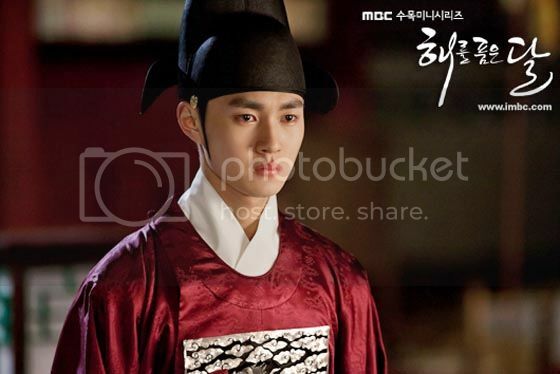 Thank you for the enjoyable recap of Moon That embraces The Sun. I will miss the young cast whose doing a good job...so well that its really got me hooked. Yeo Jin-gu is adorable. I can't wait to seen him in more roles as he gets older. He's definitely one of the child stars I hope transitions well into adult roles. Lee Min Ho super handsome. The next f4 Lee Min Ho. ha. 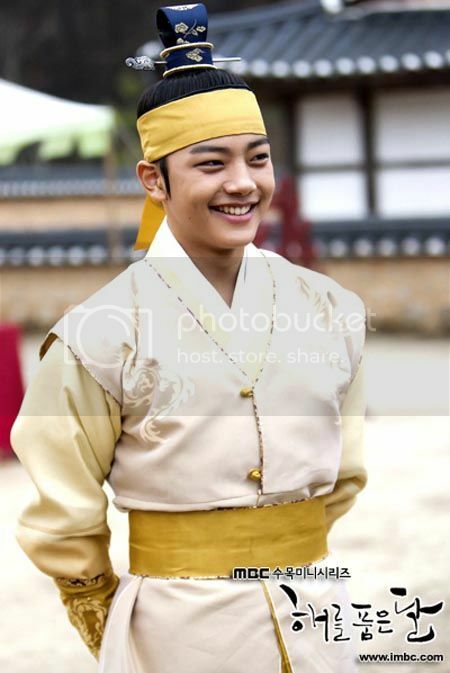 Yeo Jin Gu is so cute. I think he is a really good actor and I can't wait to see him grow up and get the main lead role. He really did blow me away in Warrior Baek Dong Soo and I hope he does the same thing in this show. *sigh* and to think Lee Min Ho is the same age as Yoo Seung Ho. 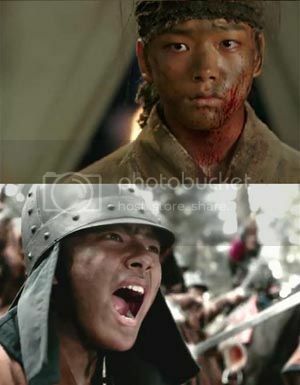 I hope this kid will be able to get the attention he deserves for his great acting. Ahaha, he actually felt jealous of Yoo-jung and Jin-gu! Was yeo jin gu in time between dog and wolf as younger lee junki? the trailer looked quite sad, hearing you say that, i need to steel my heart and have tissues alongside me when i watch it then!! Lovely actors, I am going to miss them!! love them. so much more talented than some adult actors??? cough cough.. i wanna cry... their roles are almost over.. They amaze me with their acting skills! Can't wait for all of them to grow up!